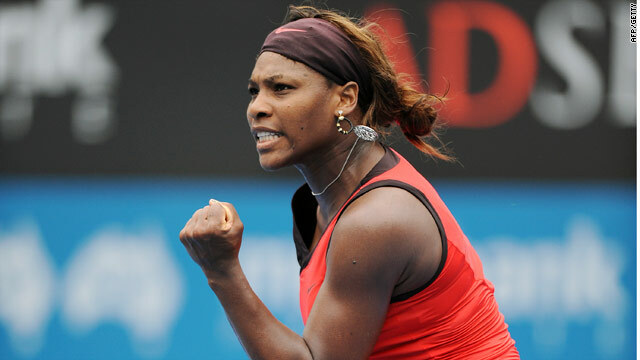 Serena was a game away from defeat before she fought back in fine style in Sydney. (CNN) -- World number one Serena Williams came from a set and 5-2 down to beat Avarane Rezai of France to reach the final of the WTA tournament in Sydney on Thursday. World number 27 Rezai served for the match at 5-3 in the second set, but reigning Australian Open champion Williams hit back to win the next five games to pos at 3-6 7-5 6-4 victory to earn a clash with defending champion Elena Dementieva of Russia. Surprise package Rezai had secured breaks in the first and seventh games before Williams at last woke up. "Was I down that far? I didn't even realize," Williams told gathered reporters. "I don't think she lost her way at all. I felt like I literally lifted my game at that point, because I knew I was going to be headed to Melbourne (for the Australian Open) if I didn't." Williams struggled to close out the deciding set as both players exchanged breaks before the top seed gained another breakthrough in the ninth game and served out for victory. Earlier, Dementieva saw off Victoria Azarenka of Belarus 6-3 6-1 in the first semifinal. It was another impressive performance from Dementieva, who had beaten compatriot and world number two Dinara Safina in the quarters. In the accompanying men's tournament, Richard Gasquet of France continued on his successful comeback trail as he booked a last four place with a straight sets 6-3 7-6 victory over Italy's Potito Starace. He will next meet compatriot Julien Benneteau after the world number 45 enjoyed a three sets win over Argentina's Leonardo Mayer. But Lleyton Hewitt's hopes of a fifth Sydney International title on home are over as former Australian Open finalist Marcos Baghdatis beat the Australian 4-6 6-2 6-3 in their quarterfinal. Baghdatis will play the winner of the Peter Luczak-Mardy Fish quarterfinal being played in the night session on Thursday. The Sydney tournament is the last ahead of the first grand slam of the season which starts in Melbourne on Monday.